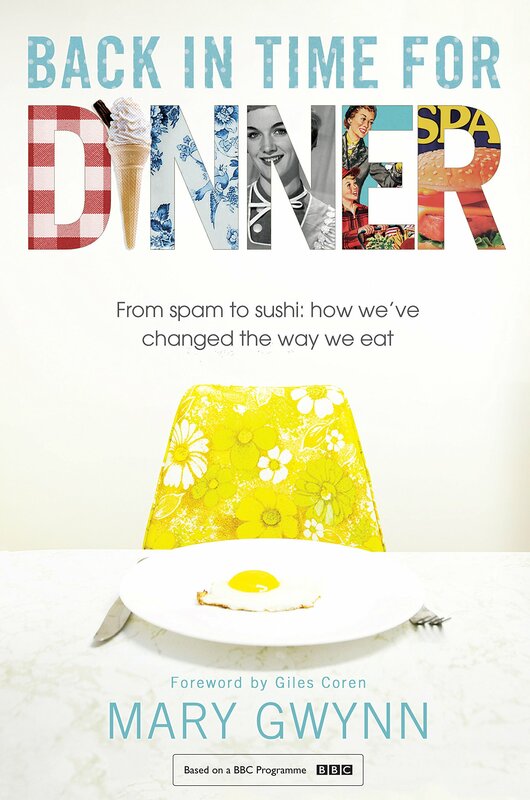 Inspired by last night’s rerun on BBC2 of the wonderful series Back in Time For Dinner with the endearingly ineffective can-opening Robshaws, my mind turned to thoughts of 50s food and iconic recipes that sum up the period. This time last year I was writing the book Back In Time for Dinner to accompany the series. Several people since have asked me why we didn’t include recipes but it was a social history book packed with all kinds of facts and memories rather than a cookbook. The repeat of the series has given me the idea to feature a recipe for each of the six episodes that for me sums up the decade. Over the next six weeks of transmission I’m going to sit down to watch each one and eat the dish to go with it! And write up the recipe and the experience here…. “One culinary legacy of the day was Coronation Chicken, a dish created specially for the coronation luncheon served to some 350 foreign guests who could not be fitted into Buckingham Palace. Held in the Great Hall of Westminster, the meal was prepared and served by students and staff from the Cordon Bleu School in London………. The recipe for Poulet Reine Elizabeth, as it appeared on the menu, was created by Rosemary Hume, although it is usually attributed to Constance Spry, who was herself responsible for the flowers at the coronation. (She advised the minister of works on all floral arrangements for the day and did the Abbey flowers herself.) The challenges of planning a menu to serve at the occasion is summed up by the two ladies in the pages of The Constance Spry Cookbook, which came out in 1956: ‘By two o’clock the guests would be very hungry and probably cold. There would be people of all nationalities some of whom would eat no meat. Kitchen accommodation was too small to serve hot food beyond soup and coffee. The serving of the food would have to be simple because all the waitresses would be amateurs’. ” Taken from Back in Time for Dinner by Mary Gwynn published by Bantam Press. I’ve taken the dish and updated it for modern palates (as I did for the archive recipes I featured in The WI Cookbook: The First 100 Years, which also came out earlier this year to mark the centenary of the WI). The original, made with chicken – in the last years of rationing a real luxury with which to spoil the guests – is rich with double cream and mayonnaise. I’ve lightened the sauce and also made it a bit more spicy for modern tastes. It’s perfect for a summer picnic or as a way to use up leftover cooked chicken, maybe for a Bank Holiday picnic. And look out for me as a guest at the 1970s dinner party in episode 3. The recipes Rochelle prepared for us at that meal will not be featuring here! 1 Put the chicken in a large pan and add the bayleaf, peppercorns, cloves, salt and onion. Top up the pan with cold water to almost cover the chicken. Bring to simmering point then turn down the heat and simmer very gently for about one and a half hours, until the chicken is cooked through and the juices run clear. 2 Remove the chicken from pan and leave to cool on a plate, loosely covered. Keep the cooking liquid for stock – I freeze it and use it for risottos. Take the meat from the bones and tear into bite-sized pieces. 3 Stir together the apricot conserve, curry paste, tomato paste and lemon juice. Use to flavour the mayonnaise and yoghurt to your taste, adding seasoning as you go. Remeber the chicken will take up the flavours so the sauce should be quite strong. Add to the cooked chicken and fold gently to coat in the sauce. Cover and chill for a couple of hours until ready to serve. I like to serve this dish the way I was introduced to it in the 70s, and the way Spry and Hume suggest in their classic cookbook – with a rice salad. Cook 25g basmati rice a head and leave to cool. Mix with diced fresh tomato, peeled cucumber, red pepper, chopped red onion or spring onions, then add a handful of blanched frozen peas, a good handful of freshly chopped basil, parsley and mint. Make up a dressing of three parts olive oil to one part red wine vinegar and season well. Dress the salad sparingly – don’t let it become soggy with dressing. Chill and serve with the chicken. 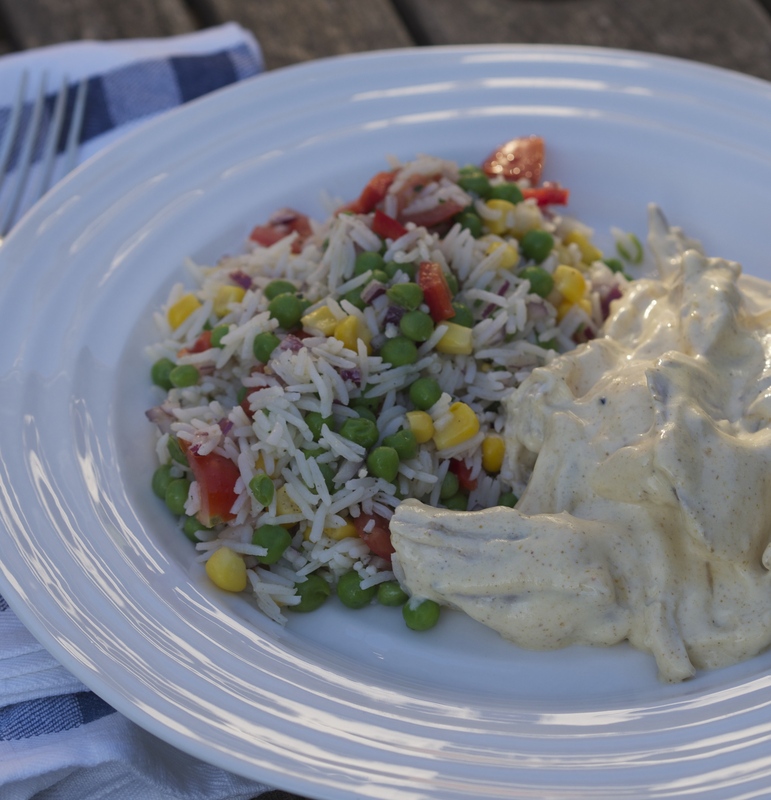 This entry was posted in Food history, Recipes and tagged 50s recipes, Back in Time for Dinner, Coronation chicken, Robshaw family, summer chicken recipe, The WI cookbook: The first 100 years. Bookmark the permalink.